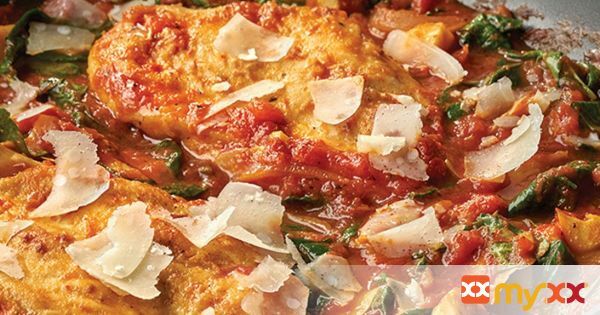 Spinach & Artichoke Chicken Parmesan- lightly breaded chicken, spinach, and artichoke hearts on a bed of wilted spinach. 1. Season the chicken with the salt and black pepper. Coat the chicken with the flour. 2. Heat the oil in a 10-inch skillet over medium-high heat. Add the chicken and cook until browned on both sides. Remove the chicken from the skillet. 3. Add the onion to the skillet and cook for 5 minutes, stirring occasionally. 4. Stir in the sauce, spinach and artichokes. Return the chicken to the skillet. Reduce the heat to medium-low. Cover and cook for 10 minutes or until the spinach is wilted and the chicken is cooked through. Top with the cheese.